Arena integrates with both Protect My Ministry and SecureSearch. Use the following steps if your organization uses Protect My Ministry for background checks. From the Membership menu, click the New Background Check option or Request New Background Check on the Person Detail page to open the page to request a background check. 1. From the Navigation menu, select the New Background Check option. 2. Click the Change link to search and select an existing record. 3. Enter the person’s information. 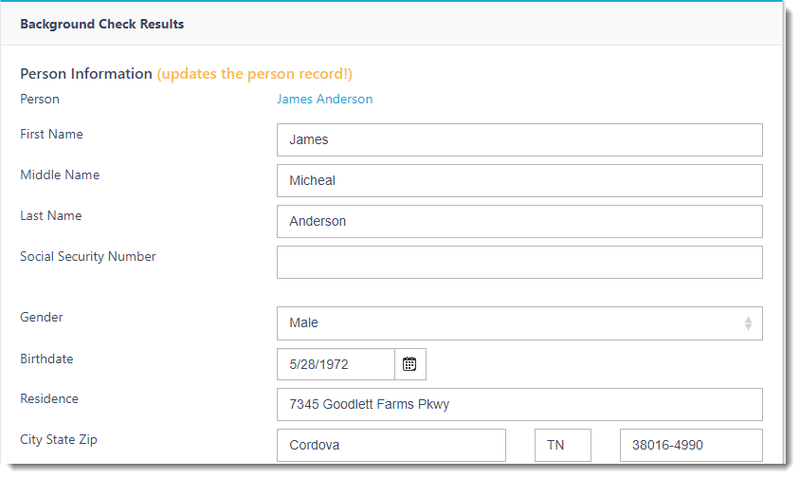 •First Name: Arena populates this field using the information on this person’s record. •Middle Name: Arena populates this field using the information on this person’s record. •Last Name: Arena populates this field using the information on this person’s record. •Social Security Number: Arena populates this field using the information on this person’s record. If the social security number is not available, enter nine numeric characters (e.g. "432531234") or 11 characters that exactly match the pattern of "###-##-####" where each # is a numeric character and the dashes are at proper intervals. •Gender: Select the gender. Options are male, female and unknown. •Birthdate: Enter the person’s birthdate. •Residence: Arena populates these fields using the information on this person’s record. Enter the information if it does populate. 5. 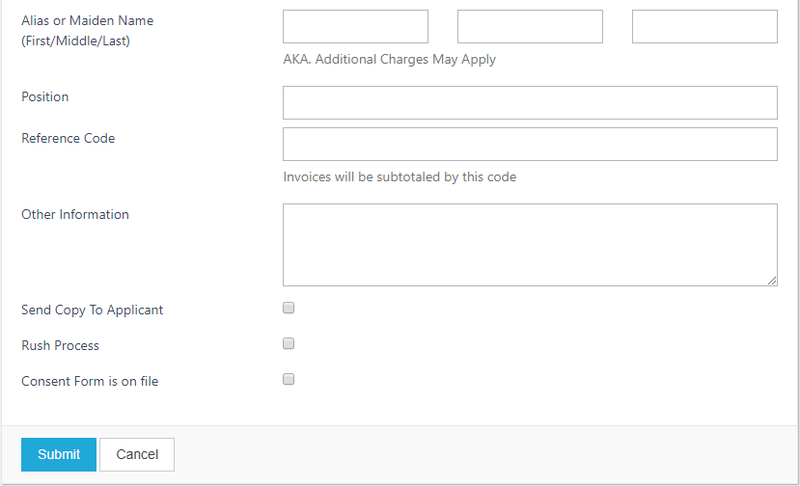 Complete applicable fields on the background check request page. •Alias or Maiden Name: If applicable, enter the alias or maiden name. •Position: If applicable, enter the position to which the person is applying. •Reference Code: Enter the reference number for each background check. Invoices subtotal by this code. •Other information: Enter any additional information. •Send Copy to Applicant: Select this check box to send the applicant a copy of the report. •Consent Form is on file: Select this required check box to confirm that a consent form is on file. •Add Additional Court Check: Click this link to add additional court searches. •Years of History: Enter the years of history to check. •Special Instructions: Enter any special instructions. Click the Submit button once you enter all information. If the request needs approval, the Approver receives an email with this request. NOTE: Under Module Settings for this page, you can link the date of this approved background check to a person attribute field.